Wakefield is a small town where a unique collection of longstanding citizens has lived mostly in harmony, accepting of each other’s foibles. But underneath the picture perfect exterior a battle rages between those who wish to preserve the historic single-lane covered bridge across the river, and the loggers who want it replaced with a modern alternative. As the days pass with no change in the dispute, tensions begin to boil over, friends turn against one another, and the town seethes with potential violence. Family man and second-generation logger Denny O’Farrell has been leading the charge to modernize the bridge. When the bureaucratic route fails to produce results, Denny and his friends need a new plan of action. But local police officer Ryan O’Farrell, Denny’s brother, is very worried about exactly how much Denny and friends are willing to risk in order to win the war. Swept up into the dispute, lawyer Raine Tara-Anne Cogshill, a newcomer hiding from her big-city past, hasn’t bargained on getting caught up in a summer of violence. Until this book popped through my letterbox I had never heard of Trevor Ferguson. Such an admission I suspect might be the literary equivalent of admitting one hasn’t heard of Ian McEwan back home in the UK but having scoured the UK amazon website and finding no trace of him there, I feel a little less embarrassed in confessing to not previously having read anything by “Canada’s best novelist”. Clearly us Brits are missing a trick in overlooking Ferguson and along with Thanksgiving, ice-skating and butter tarts (yup, we don’t do those either) he is a piece of Canadiana that I’m planning to export home when we leave. 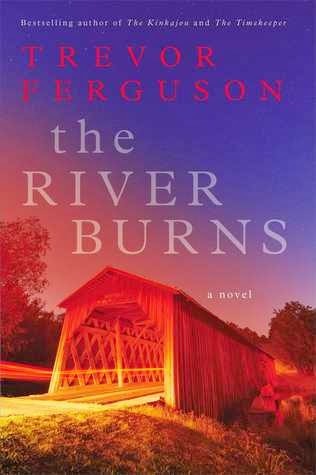 What captivated me was Ferguson’s ability to plonk me the reader right down in Wakefield and convey the sense of small town Quebec and the beautiful surrounding countryside undulating through the seasons. There is a delightful cast of characters who lived and breathed for me (with the notable exception of the ‘tree huggers’ who seemed to run around half naked hurling explosives at people - clearly UK tree huggers are a far friendlier bunch) but despite this somewhat odd characterisation I was quickly swept along with the unfolding drama. Apparently The River Burns began as a short story that then became a film script before transforming into a novel, although I can't help but wonder if it will make it to the silver screen before too long as it would transpose so well. I already have my casting preferences for Tara and Mrs McCracken. But in the mean time would somebody in the publishing world please introduce Trevor Ferguson to the UK? This sort of read is just too sumptuous to miss. Thank you to Simon & Schuster for our review copy. All opinions are our own.